Kukicha is a uniquely Japanese Tea. 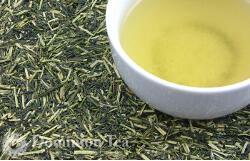 Made primarily from the main stem of the tea plant, this tea has a light salty and creamy flavor. So the tea industry loves the mythical stories about the creation of tea. Yet, Kukicha doesn’t have one. In fact, this tea is barely reviewed or talked about in the troves of books about teas. It may get a small review of how to brew it and what it is made of but no one talks about where it came from. This is a shame, but it is also an indication this is a more modern tea. So while we too have no origin story, we have a reasonably good idea of when this tea appeared. Japan started to mechanize the harvesting and production of tea in the early 1900’s. However, it wasn’t until after World War II that this process took off and became the norm in the tea industry for the country. Anyone who has studied business or modern history will have heard of William Deming and his profound effect on the Japanese manufacturing sector after World War II. His focus on quality through consistency of production is often pointed to in the automobile industry as to why Japanese car makers overtook American car markers by the 1980’s. The automobile industry was not the only industry that implemented Deming’s processes, it was adopted everywhere in Japan. Kukicha makes sense as a product of this era. It uses the leftover materials from the production of Sencha, Gyokuro or Hojicha. The stems are cut to uniform size and blended with the leftover leaf. The uniform size of the stems is a key component to assessing the quality of the tea. The more uniform the stems, the higher quality the tea. A beautiful representation of the care needed in proper manufacturing of any product. As mentioned above, Kukicha can be made from the leftover stems of Sencha, Gyokuro or Hojicha. Each produces a slightly different flavor. All must brewed at a lower temperature, like other green teas,between 165-185°F. They can steep for up to 3 minutes, but are quit good with multiple short steepings. Kukicha, like other Japanese teas, is a perfect tea for a Kyusu. This beautiful tea is often overlooked, but it deserves your attention. So give it a try! This entry was posted in Tea Culture, Tea History, Types of Tea and tagged Japan. Bookmark the permalink.